Yes, my legs are warm. Why do you ask? I love it, and while I think the pattern is pretty, I know the yarn is what makes it. Silk garden is wool and silk and mohair, so it has warmth, and a sheen, and a halo. It is produced by a Japanese genius who blends colors into one another. During Christmas break, I had an idea for a striped baby sweater, using Noro interspersed with black. Actually, I can’t say I had the idea, because I am pretty sure it came from Pinterest, which I can’t really say, because no ideas come from Pinterest. They all have different sources and just go to Pinterest to rub against each other. It’s like a high school dance. So, I ordered some Silk Garden Sock, which adds nylon to the original formula, for durability, and is thinner, so it is a bit cheaper. When it came, I couldn’t see it being another sweater- it wanted to be leg warmers. When I was in middle school, leg warmers became a mainstream fashion trend, rather than just a…hmmm…who does wear leg warmers, usually?…Anyway, my luckiest friends convinced their moms to buy them leg warmers in purple, and metallic, and rainbow. Mine were cream colored and cable knit, which ironically, is a style that I like now…My mom understood something, then. 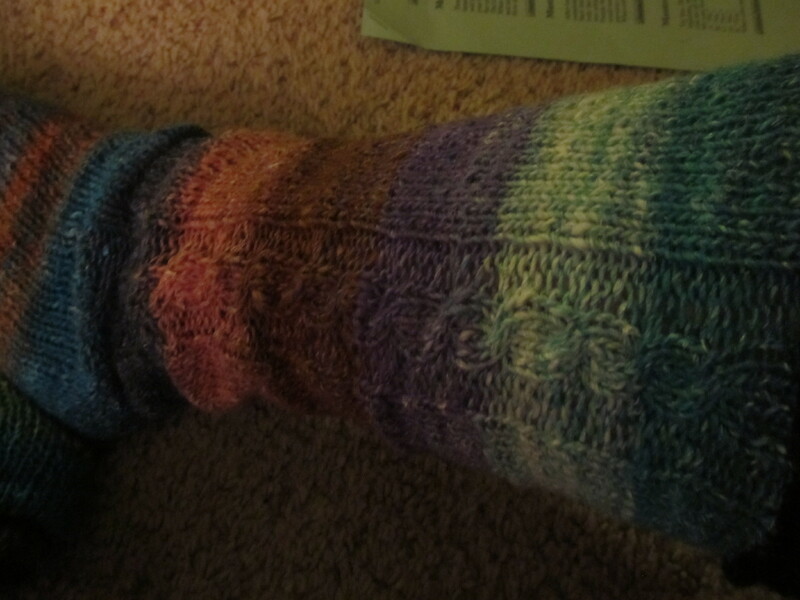 However, when I saw my 100 gram skein of Noro, I knew that it’s destiny was to become leg warmers for me. Modern Leg Warmers! So I can wear them to yoga, and camping. Yes, camping! Back when leg warmers were stylish, my brothers used to ask me, "are your legs warm? are your legs warm?" This was an extremely generous ball of yarn, also- when I weighed it when I was mostly done with leg warmer #1, there were still 67 grams left, and even after the second one was finished, there was enough for a small cowl. I used black sock yarn, I think from Knitpicks, left from another project to make ribbing at the top and bottom as a frame. It is thinner, and has a different gauge, so I used different needles. I also got a little bored, so I added a cable to make things interesting. The color gradations in Noro are hard to predict- if it is important you to have identical twins instead of fraternal, Noro might not be the yarn for you. I mostly wear flip flops in the summer, so I can slip these on when we're camping, and not have to pack more shoes. On size 3 needles, cast on 52 stitches in a solid contrast yarn.Knit in 2×2 rib for 3 inches- this becomes a cuff you can roll up so you can put your flipflops on, or roll down to cover your toes. 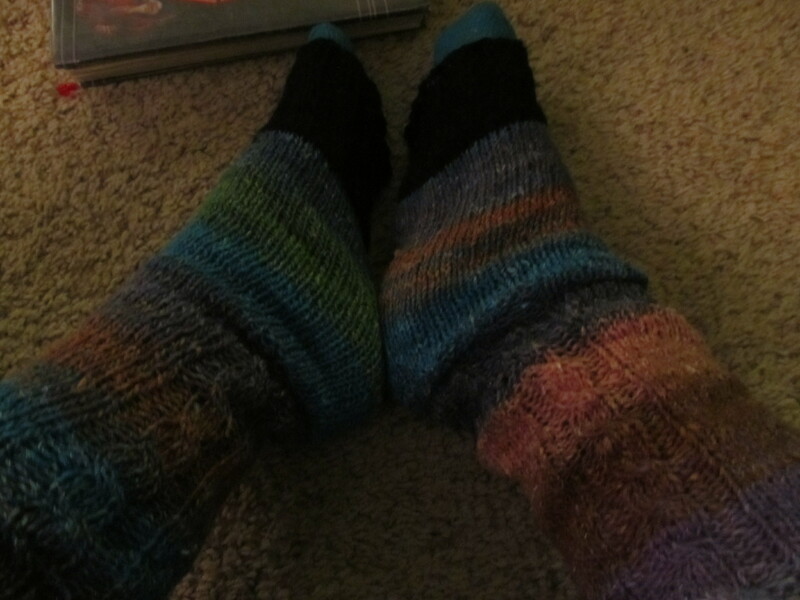 Swtch to Noro and size 5 needles. Knit stockinette until bored. Or 6 inches, whichever comes first. On needle 1. knit 4, perl 2 knit 4 perl 2 knit 18 til end of the needle. every 6 rows, cable front. Continue until it is a good fit for your leg, then switch back to the contrast color, do a 2×2 rib for 2 or 3 inches and bind off with super stretchy bind off. A confession, if you have even read this far- here’s why I should write knitting patterns- people who are really looking for patterns don’t really want to see “knit in stockinette until bored” those are terrible directions. If you are looking for a serious pattern, I am sorry. But I am also lazy- it is hard to write serious patterns.